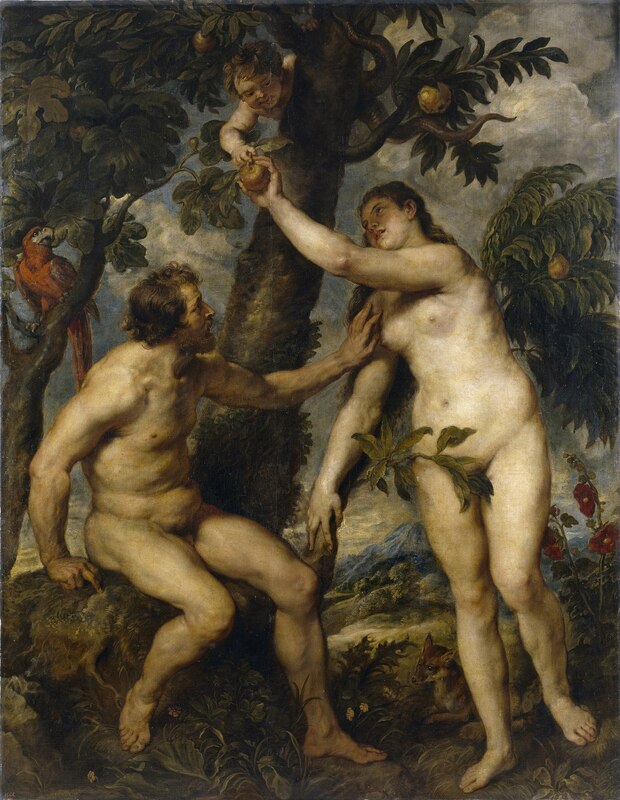 As far as paintings about Original Sin go, Rubens’ copy of The Fall of Man by Titian is only a little bit original. We all know the Genesis story. God creates humans, God gives humans ONE rule, humans are tricked into breaking said rule by sneaky Satan-snake, humans are forevermore born with original sin and doomed to die. At least, that’s the story that’s been told for thousands of years. Certain details of the story are a little fuzzy, however, like what serpents look like. When Rubens collaborated with Jan Brueghel the Elder on The Garden of Eden in c.1617, Rubens painted a normal looking snake, one of the only animals left for him to paint rather than animal expert Jan. (Not that Rubens wasn’t an animal expert--I mean, he clearly knew snakes are tube-shaped.) But the serpent here, originally created by Titian and faithfully copied by Rubens, is some sort of tentacle baby nightmare that X-rays of Titian’s painting show even he wasn’t planning to include at the start. Eve was just going to take the apple of her own volition. This means that at some point Titian thought it would be a good idea to change some of the tree branches into tentacles and stick a baby torso on top, which he then did. Pro: it makes Eve look like more of a victim of temptation. Con: there now exists a tentacle baby monster. The question of what kind of fruit they ate is also a little hazy. Whereas figs or dates may seem like regionally appropriate options, over the centuries people have settled on the apple, which Rubens depicts Eve reaching up to take from the Baby-Snake-Horror. One might think the humble apple was decided upon as a catch-all term for generic fruit item, but like many disappointing things in life, the origin is actually a Latin pun. The Latin word for apple, malum, is the same as the Latin word meaning Wrong, Evil, or behavior that is inherently bad. This pun exists only in Latin, but since the Bible was read exclusively in that language for over a millennium, apple just kind of stuck. Rubens encountered Titian’s painting when he was in Spain in 1628 on a tricky diplomatic mission to unite the country with their traditional enemy England. Culture at the Spanish court was more somber and subdued than at the other courts Rubens frequented, largely due to strict religious and political sensibilities. With his harmonious compositions and the psychological subtlety of Renaissance Italy, Titian suited their reserved taste far more than Mr. Baroque himself, Rubens, whose work was wildly exuberant in comparison. But Rubens’ style changed after his encounter with Titian. After copying all of Titian’s works in the Spanish Royal collection, Rubens’ work became looser, less ornamental, and more concerned with color than with line. He would ever after consider Titian the greatest of all painters. Rubens’ Fall of Man is today part of the Prado’s collection, just like the original. Rubens retains Titian’s simple composition, focusing on the sinful snacking rather than the fauna of Eden, but he does change a few things up. The nudes are, without question, more muscular, more fleshy, more defined than Titian’s, and also less clumsy. Rubens based his Adam figure off of the Belvedere Torso, turning it slightly and eliminating the need for the awkward fig leaves. The cute little fox, everyone’s favorite adorable woodland creature, Rubens retains from the original as a symbol of evil and lust. Showing Jan Brueghel’s influence, however, Rubens invents a parrot above Adam’s shoulder. While it could be just another animal in paradise, parrots had specific symbolic meaning in Rubens’ day. Because it was believed that parrots only lived in tropical regions as they couldn’t bear to get their feathers wet, they became associated with purity, and in particular Jesus and his mother Mary, who were both free from Original Sin (the very sin started by Adam and Eve in the very moment depicted here). Now prepare yourself for another Latin pun. The call of the parrot was understood to be “Ave,” which was the greeting used in the Vulgate translation by the Archangel Gabriel during the Annunciation, further cementing the parrot’s association with the purity of Christ. The peach tree above Eve’s shoulder is also an allusion to Jesus, as according to extra-biblical lore it was a peach tree that bent before Christ during the flight to Egypt. Thus, Rubens paints the story of Original Sin, but goes a little further than Titian by also framing it within symbols of the antidote to that sin, Jesus, who would later redeem mankind in The Bible: Part II. Belkin, Kristin Lohse. Rubens. London: Phaidon Press Limited, 1998. Hodge, Suzie. Rubens: His Life and Works in 500 Images. London: Anness Publishing Ltd, 2017. Impelluso, Lucia. Nature and its Symbols. Translated by Stephen Sartarelli. Los Angeles: Getty Publications, 2004. The Fall of Man, Adam and Eve or Adam and Eve in the earthly paradise is a 1628-1629 painting by Rubens, now in the Prado in Madrid. Once attributed to the minor Dutch artist Karel van Mander, it is now recognised as a work by Rubens. It is a copy of the painting of the same subject by Titian, seen by Rubens during his 1628-1629 trip to Madrid for peace negotiations to end the Dutch Revolt. It reflects Raphael's influence on Titian and Jan Brueghel the Elder's influence on Rubens, who adds a parrot and changes Adam's posture, musculature, age and expression. Check out the full Wikipedia article about The Fall of Man (Rubens).